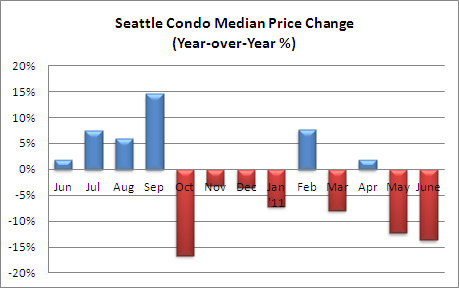 Seattle’s soft condo prices contributed to strong condo sales activity in June. The $246,000 citywide median condo sales price in June reflected a 13.68% year-over-year drop and a slight one-month decline of 1.5%. Prices slid in all Seattle MLS areas except for West Seattle, which improved 15.7%. 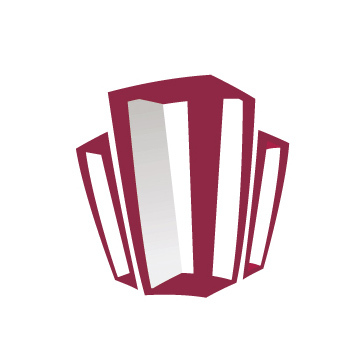 The attractive, lower prices continued to stimulate sales of entry-level condominiums. 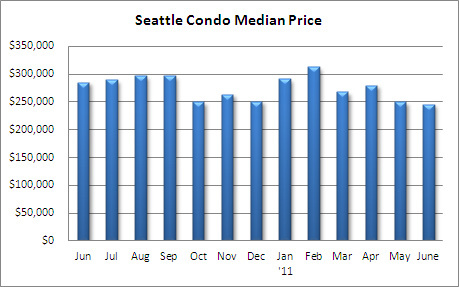 In June, 50.8% of all condos sold in Seattle were priced below $250,000 compared to 37.9% last year. The higher number of lower price condos sales, along with depressed values, shifted the median sales price point downward compared to the same period last year. Overall, June’s condo sales volume was healthy with a 31.1% year-over-year increase in the number of pending transactions (condos going under contract). 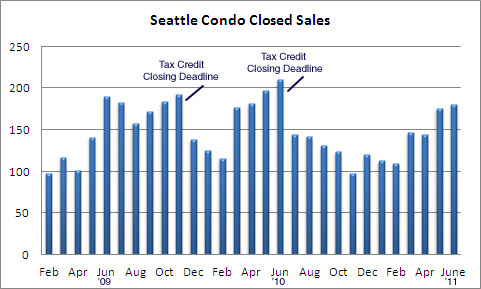 Though, anything compared to the stalled sales following the expiration of the tax credit last year would look good. The number of pending transactions also reflected a one-month dip of 9.8%. 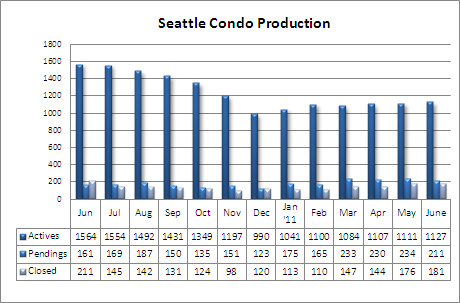 Nevertheless, it was one of the better months for condo sales over the past 13-months. 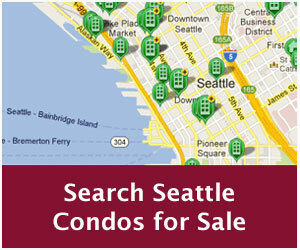 The number of closed condo sales continued to trend upward with a one-month increase of 2.8%. Compared to a year ago, closings were down 14.2%. 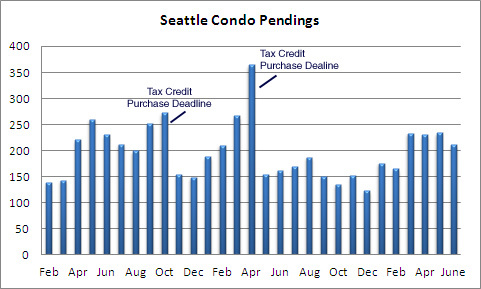 However, the closing deadline for the tax credit was last June, which resulted in a higher than normal closing volume. Thus, the 30 unit difference was remarkable given there were no incentives to propel sales this year…the market drove sales on its own. The number of active condo listings continued to remain flat this year, and was down 27.9% compared to June of last year. For many condo owners, the hot rental market offers a compelling alternative to selling at depressed prices. 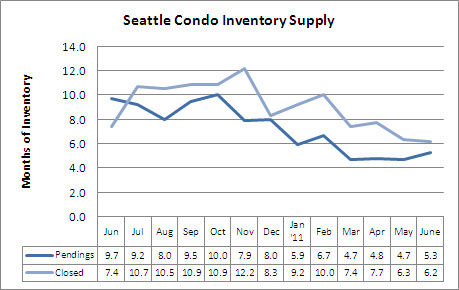 Seattle’s condo inventory supply rate was moderate in June, indicating a relatively normal market environment. 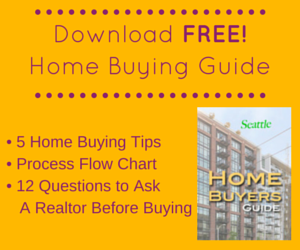 While the lower supply tend to benefit sellers, the lower values definitely favor buyers in this market. Anecdotally, our first-time home buyers are starting to find the number of choices scarce, particularly in the lower price ranges, and lately, are experiencing competition from other buyers.